We have a number of entertainers based across the country so we always have someone local to you. But our main office headquarters is based in Ealing at: ‘Froggle Towers’, Boundary House, Boston Rd, Ealing, Hanwell, W7 2QE. What makes you different from other party entertainers? No party is ever the same. 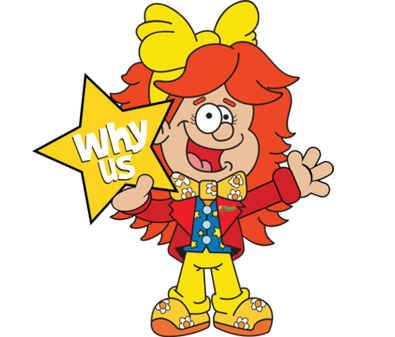 We know this and we know that as a good children’s entertainer, you have to respond to what children say on the day, and create a show that revolves around their energy levels. 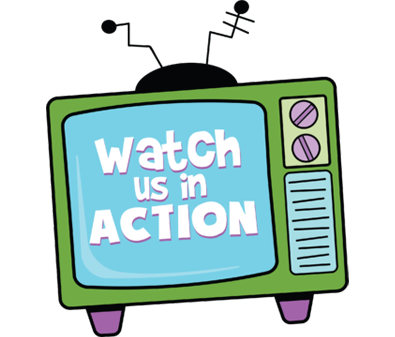 For example if kids are highly energetic and ready to start jumping up and down, we won’t try to sit them down quietly and make them watch a show for 20 minutes, we’ll get them up and play active games and dance to music. Too many entertainers have one set routine and simply try to plough through it even if no one’s paying attention. Our team of entertainers are carefully picked to make sure they love working with kids and know how to enthuse them every step of the way. Each of our children’s entertainers has bundles of energy and the shows are very lively, with loads of fun activities for children to watch and take part in. How do I know what type of party to go for? If you’re not too sure what party to go for, the best thing to do would be to find out if your son or daughter has a preference. Alternatively feel free to discuss it with us and we can advise you. We know what children enjoy so no matter which one of our parties you choose, you can be sure they’ll be varied and thoroughly entertaining. Do you bring all your own equipment with you? Yes we bring everything. We bring all our props, music system, etc. So apart from food and drink you don’t need to worry about a thing. Not at all. We can cater for parties for any age range. In cases like this we’ll design the parties specifically so that there is something in there for everyone. What do you do in the science party? Our science parties include a range of fun science demonstrations that kids get to watch and come up to the front to help with. All the demonstrations that we do will be age appropriate. As well as being visually stunning and entertaining, kids will actually discover how the science works and how these amazing demos are possible. The kids will also get to try out their own scientific experiments in the party like making slime and other experiments. They can even take them home afterwards if they so wish. There is a lot packed into this party to keep it engaging and fun. The party also includes a range of fun science related games, snow machine, bubbles and prizes for the children, plus the option of balloon modelling. Are your science parties safe? Yes they are safe. All the experiments we do are fun, safe and age appropriate. There’s also no mess to clean up afterwards. What’s the science part of the party? Basically the whole thing! The children will not only experience the fantastic demonstrations for themselves and hands on experiments but they will discover amazing things to do with ‘fantastic forces’ like static electricity, air pressure, magnetism and friction and more. We have worked alongside a top science communication expert, Maria Rossini, to ensure the perfect balance of science content and fun. Maria’s working credits include the Science Museum, British Science Association for the CREST awards, Science Learning Centre, Disney, BBC, the Crick Institute and many more. Your children really will explore the amazing world of science whilst having incredible amounts of fun. Is there a break in your parties for food and drink? You can have a break in your parties. We can accommodate the party to be how you prefer. 1 hour parties usually run straight through with no break. For 1.5 hour parties, the suggested format is a one hour show, followed by 30 minutes of balloon modelling (whilst the children have tea). For 2 hour parties the suggested format is a 45 minute show, then a 30 min break for kids to have food and drink, (during which time your entertainer will make balloons for the children to take home with them) then another 45 minute show. These are only suggested formats though, so we can tailor the party to suit your needs but we do find these formats work very well to help your party run smoothly. Do you have a minimum or maximum number of children at a party? No there’s no minimum or maximum. But the price does increase if you go above 35 children. Do you give out sweets? No. We don’t give out any food, confectionary or consumable goods of any kind. This is due to allergies children may have to them. What kind of prizes do you give out to the children? My child saw your show. Can you do something different for their party? Of course we have lots of different shows so there’s no risk of being bored by repetition. How many entertainers come to the party? Unless you specifically request an additional entertainer there will be one person there. Are the entertainers male or female and can I choose which I’d prefer? We have both male and female entertainers. We can usually offer you the choice of having a male or female entertainer, subject to availability. But it does help if you book as early as possible to give the best possibility of accommodating your preference. Please do be aware though that we can never offer a guarantee of your entertainer being male or female. e.g. in case your entertainer has to change due to illness. For most parties -yes they do, unless you request otherwise. We can always accommodate your preference. Costumes vary depending on the party you go for. Typically most of our entertainer/ magicians wear a fun bright coloured red, blue and yellow costume. Themed parties obviously have the entertainer dressed up as a character from that theme. If you would prefer not to have a costume we are happy to accommodate this too. The science party has the entertainer in a cool science lab coat and science goggles. Our games & dancing parties and our bubble and games parties tend to have the entertainer in our red froggle polo shirt. What’s the difference between an entertainer and Froggle the Clown? 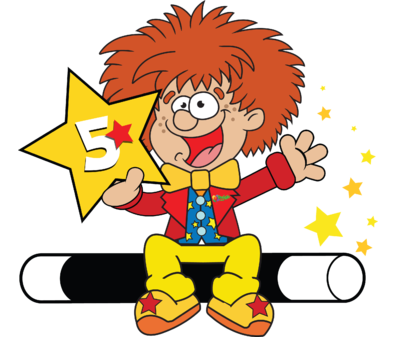 The shows are very similar in nature but Froggle the Clown is dressed in a clown outfit complete with red nose, make up and wig whereas the entertainer is dressed up in a bright fun and colourful costume but without the wig, nose and makeup. Yes. Absolutely. All our staff are DBS checked (formerly known as CRB). Do you do party bags and what kind? Yes we do. Our bags contain toys that appeal to both boys and girls or you can chose bags designed specifically for just boys or just girls, depending on what you’re after. Click for more information on party bags. How much notice do I need to give for ordering party bags? We need a minimum of 4 full days’ notice. So if your party is on a weekend then you need to order bags the Tuesday before the party, by 4 pm on that Tuesday. Parents sometimes like to wait till the very last day or two before the party to order the exact number of bags that they will need, but it’s very rare that you will know the exact number of children coming to your party until on the day itself. So it’s best to order a few extra in case siblings come along or someone who didn’t RSVP turns up. What other party extras do you do? See our party extras page for a list of all our party extra services. All bookings are done by telephone. Simply give us a call or email us to call you at a convenient time and we’ll take down a few details about the party. We do ask for a small deposit to secure the booking but then the rest is paid to your entertainer on the day in cash. You will get a confirmation from us to say that everything is booked in and your entertainer will arrive a bit beforehand to set up. We ask for deposits to be paid over the phone by credit or debit card. 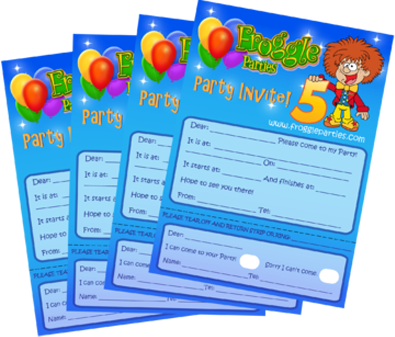 If booking quite far in advance we can accept bank transfers and postal orders made payable to ‘Froggle Parties’. Unfortunately we do not accept cheques. The remaining balance is paid to your entertainer in cash on the day. Our parties are very popular and operate on a first come first serve basis, so it’s best to book as soon as possible. We can only confirm a booking on receipt of a deposit. What happens once I’ve booked the party? Just relax. That’s it. We will send you a confirmation of your party by email and you will get a receipt for your deposit in the post. Your entertainer will turn up 15 -30 minutes before the due starting time in order to set up. (Set up time varies depending on the type of party you go for) So all you need to do is relax and enjoy the show. Set up time varies depending on the type of party you go for. Your entertainer will arrive between 15-30 minutes before the start time to greet you and to set up. Do you have a backup entertainer in case my entertainer is ill? Once a deposit is made, it cannot be refunded if a party is cancelled less than 4 weeks before the date of the party. If you cancel more than 4 weeks in advance, we can refund your deposit but please note that a £10 admin fee applies. If a party is cancelled less than 4 weeks before a party, the deposit is non refundable and non transferable to another weekend date. We can however reschedule your party to a later date as long as it is on a weekday. In the event of extreme weather conditions, then you can cancel a party and get a full refund on the deposit but only if your entertainer is unable to get to the party. If the entertainer is able to get to the party and you still cancel then the deposit is non refundable and non transferable to another weekend date. We can however reschedule your party to a later date as long as it is on a weekday. How do I send comments or feedback? If you have any comments you want to send in or you want to speak to us, feel free to either contact our head office at 08450 504 509 or 0208 617 9070, or email us at enquiries@froggleparties.com.